While i was browsing the GDS i realize that we dont have to many grunge walls in this category,so...is time to spam the GS & GSD with grunge stuff,this time with Athrun Zala. For some reason i think that i lost a lot of skills after i made the Forsaken Memories wall,also i start to make "new" stuff that looks very simple (Memories,Wings of Dementia) or weird stuff(L.A.I.N),so i have to take some time,and think,and learn how to use my new brushes and textures,so after this "training" i start with a new wall,with Athrun. ooo nice nice athrun <3 cool swirly things in the back reb-kun! :3 really gives the impression of reincarnation. nice job on this one! The interesting glowing swirls add a lot more dimension to the grunge. Neat work. It does show that asuran iz back, feels like hes the main character instead hehe, anways nice pic, thx for sharing it. Very nice. The background is really good. And the scan of Athuran goes very well with it. A really distant look in his eyes. Goes well with the whole feel of the piece. Well done. I like the grungy look to it. Very nice. ^_^ Nice image choice too. =^_^= Great wall! I just love it! 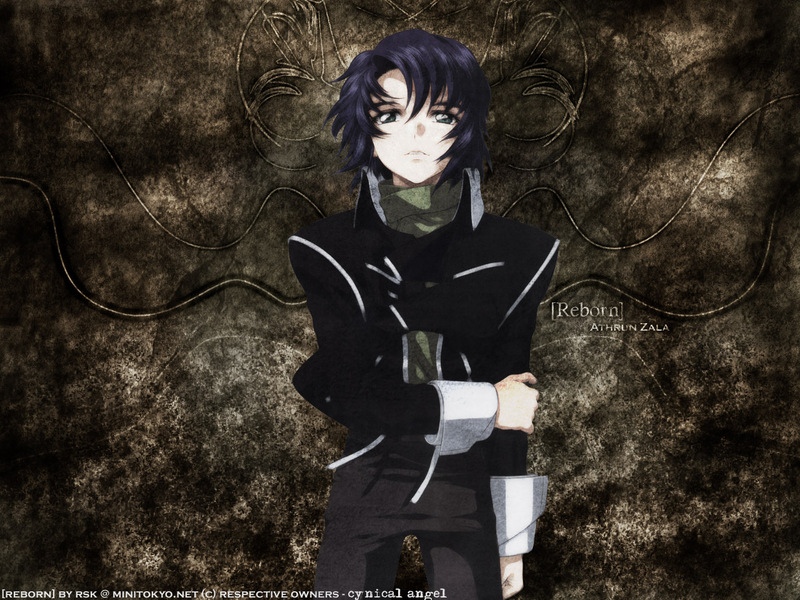 (now it's my new desktop hehe I hope you don't matter) I love Athrun! he looks so handsome, still...it makes you fell a little bit sad, just by looking into his eyes! great pic! and perfect title! Nice one Rebel, i was thinking you were going Cliche on me but yeah love how the design from the back becomes somewhat of an angel wing, grea tjob on the dirt grunge! hey rebel nice one ^_^~! the bg looks simple but it isn't bad since I like the texture and your composition. I think Athrun just need some extra blending work into the bg =O....that's all ^_^ keep the works =D~! I really got almost no complaints for this, it's the best GSD grunge wallpaper I've seen so far... maybe the only thing I would change it's the typo... I think that a font with serifs and a more "classic" look would work better. Nonetheless, good job. the character is nice too...great work!!!!!!!!!!!!!!!! That looks very nice! Great work with the grunge wallpaper! ^^ Athrun is so cool. The guy (Athrun..? ...never seen GSD) seems a bit bright for the BG but still, very, very cool. Anyway, I really like the background that makes me think of an antic door in stones. The scan of Athrun is great, but I think you should play with the level in Photoshop to enhance the colors, cause he look a bit pale. Wicked grunge here rebel, real dirty and dark. The grunge overlaying the scan doesn't look too bad but the one that does irk is how how he's got no outline to him, which makes him look a bit odd. And the design in the back was a nice way to add some flow and contrast.